Business trips by air have to happen. With that comes stress of work and travel and, a likely way to combat this is with alcohol. While that may seem like an easy option drinking on a plane has many negative side effects. 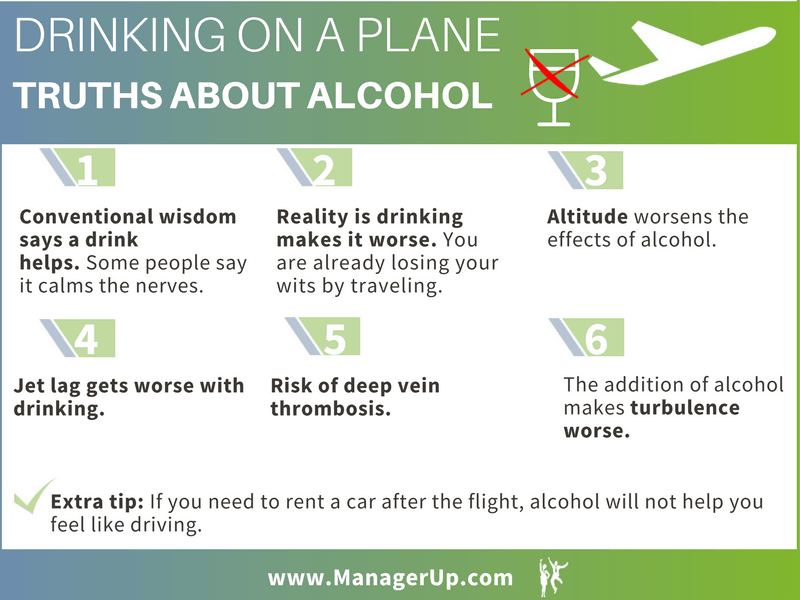 And drinking on a plane not only affects you during the flight but possibly for days after as well. The next time you have to fly, avoid the booze. You will be more alert and readier to take care of business when you get there. Sans alcohol, air travel already affects the body and mind in many ways. With the addition of alcohol, those side effects can have negative consequences. Let’s take a look at what people think happens by drinking on a plane and what really happens. Then, we will take a look at seven things that can put you off your game because you were drinking on a plane. Some people say they must have something to drink when flying. “Steadies the nerves,” is a common reason. Other people just have a fear of flying and a drink helps allay that fear. Many people equate flying with vacations, thus vacations perpetuate having a few drinks. Whatever the reason is conventional wisdom says alcohol helps overcome these concerns or is the norm for air travel. Although alcohol is perceived as a sedating drink that induces sleep, it can actually create insomnia and disturbed sleep patterns. Some studies show that 15-28% of subjects used alcohol to help them fall asleep. And according to The National Sleep Foundation, 20% of Americans use alcohol to help them fall asleep each night. While this may help initially, the use of alcohol quickly loses its effectiveness as a hypnotic, while retaining its sleep disturbing properties. Well, alcohol does “steady the nerves.” Alcohol does lower inhibitions. It also leads some people to a false sense of security. A report at Bryn Mawr College compares the effects of alcohol on the brain to what happened to Phineas Gage. Mr. Gage is famous for surviving a railroad rod penetrating through this skull. The accident destroyed his prefrontal cortex. It also changed the man from an easy-going, hard worker to a brawler. Why? Not having a prefrontal cortex eliminated his impulse control. While this is an extreme example it is a good reminder that situations and substances can alter our impulse control. According to a study done by Oregon State University and UCLA, alcohol can restrict impulse control. This means that simple tasks will become harder to finish and finding a solution to simple problems becomes nearly impossible. This is important to keep in mind if you are flying for business. Drinking anywhere but especially drinking on a plane can create that loose feeling, which is your impulse control slipping away. You are more likely to make a rash decision. As a person who makes decisions that have dollar values into the millions, you need all your wits about you all the time. When you are on a plane, especially going from one time zone to another, these effects are magnified. While alcohol may seem to lower your inhibitions at first, it is linked to the development of anxiety and mood swings in generally asymptomatic people. Drinking on a plane can even affect your next-day behavior and moods. From an executive standpoint, this can be detrimental to that big business deal that you’re flying half-way across the globe to solidify. KLM Airlines takes the matter so seriously, they cover it on the company website. It is common knowledge that having a few drinks can lower your inhibitions and ease slight anxiety. This same principle should not be applied during air travel. Being at high altitudes and going from one time zone to another is already a shock to our body and alcohol will one exacerbate this effect. The interior pressure of an airplane drops as it rises. It never gets dangerously low but at high altitude, we are receiving about 4% less oxygen than we would on the ground. A 1985 Federal Aviation Report (FAA) found that the lower levels of oxygen on an airplane impaired cognitive function more than alcohol. This means that the second we reach higher altitude our bodies are already struggling to regulate internal functions. Coupling this with a few alcoholic beverages can lead to sickness and cognitive impairment. It’s important to note this decrease in oxygen while flying. This means that the same number of drinks you would have on the ground can impair you significantly more when having that amount of drinks on a plane. Simply put, altitude and alcohol do not mix. Another complicating factor of drinking on a plane is the air in a plane is very dry. You dehydrate more rapidly in a plane than you do on the ground. Alcohol is a diuretic. The combination means you lose vital fluids faster than normal. The University of Connecticut has studied mild dehydration and found it does affect how people act and feel. The report claims that mild dehydration in men and women caused headaches, fatigue, and difficulty concentrating. Problem-solving skills were altered as test subjects perceived more tasks as difficult. Test subjects, predominantly the males, also experienced difficulty with mental tasks, particularly in the areas of vigilance and working memory. Mild dehydration can cause a whole shift in your body’s short-term cognitive abilities. While flying it is already a challenge to maintain proper hydration, add alcohol into the mix and it’s a recipe for disaster. As an executive when you walk into a business meeting, you need all your mental faculties intact. Getting off an airplane and going straight to sort out a business deal can already be slightly disorienting due to mild dehydration and time zone changes so, nix the alcohol to set up for success. According to the Mayo Clinic symptoms of jet lag can include mood swings, disturbed sleep, daytime fatigue, difficulty function or concentrating and a general feeling of being unwell. This is something your body will most definitely go through if your air travel requires time zone changes. Drinking on a plane and the effect it has on a body makes the situation and side effects worse. Alcohol exacerbates jet leg symptoms. As a result of rapidly crossing different time zones, your body needs time to adjust. Alcohol disturbs your circadian rhythm or your internal body clock. So, it makes it more difficult to adjust your internal body clock to your new destination time. Harvard Health, a publication of Harvard University, says to avoid caffeine and alcohol. Both promote dehydration and can disturb your sleep. As previously discussed, mild dehydration has many side effects. Especially for high functions business executives. If you are interested in how to get over jet lag, have a look at the post How to Fight Jet Lag. An Executive Survival Guide. 5. Drinking on a Plane Increases the Risk of Deep Vein Thrombosis. In general, alcohol lowers your risk of deep vein thrombosis (DVT), which is a blood clot in a deep vein, usually in the legs. However, the situation reverses on long trips where you are in a seat, especially on plane trips. According to the Centers for Disease Control (CDC), air travelers with long periods on the plane are at an increased risk of DVT. DVT can happen to anyone, especially those who sit for long periods. Air travelers are at a higher risk because of sitting and being in a cramped position for longer periods, with less chance of getting up and walking around. If you are drinking on a plane, you are less likely to feel the need to get up and walk around. Your natural inhibitions are put to the wayside. The more you learn, the more you know that drinking on a plane is just a bad idea all the way around. Probably one of the most detrimental consequences for drinking on a plane is the loss of energy. For busy executives, this is something that cannot be forfeited on a business trip. According to the National Sleep Foundation, alcohol disturbs your internal clock. When you have a drink, it may help you fall asleep right away during the flight, but you will likely wake up feeling wide-eyed in the middle of the flight. This can obviously put a damper on your daytime energy, which will leave you feeling exhausted and unable to concentrate once you reach your destination. While sleeping on a plane isn’t ideal sometimes it is necessary to be able to do your best work on a business trip. Drinking alcohol on a plane can hinder your rest by contributing to poor quality of sleep. According to the National Sleep Foundation, alcohol can block REM sleep. REM sleep is considered to be the most restorative type of sleep. With less REM you will feel groggy and unfocused. Both a likely consequence of drinking on a plane. Lastly, drinking on a plane leads to extra bathroom trips. Typically, your body knows when it is time for sleep and not time for trips to the bathroom. This means that your body has learned to put your bladder into hibernation for the night. But alcohol, a diuretic, can more your need to use the restroom more, which in turn will interrupt your normal sleep pattern. 7. Drinking on a Plane Aggravates Breathing Problems. Since alcohol causes your whole body to relax, including the muscles of your throat, it increases the risk of snoring sleep apnea. Sleep apnea does not allow you to get a good night’s rest as your body continuously wakes up throughout the night because of air restriction. This will most certainly leave you tired and groggy the next day because it’s like you didn’t even sleep at all. All of these consequences of drinking on a plane are negative and far outweigh the fact that having a drink while traveling will “steady the nerves.” For executives, it’s important to remember this as business travel is a normal part of our routines. When you touch down, are you going to rent a car or is someone picking you up? If a rental car is in your future then drinking on a plane is a recipe for disaster for sure. First, driving while intoxicated illegal and dangerous for your safety and that of others. NEVER drive under the influence. Second, when you are getting to your destination, you are already tired and probably frustrated from being on a plane, working your way through security and delays. Add alcohol on top of that, and you are certainly not in shape to drive a strange city in a vehicle you are not familiar with. The DUI limit may be .08, but you will likely be charged with an offense with less than .08 Blood Alcohol Content. New York State can charge you if your BAC is more than .05. Battling a ticket or even a criminal charge is not something you need to do at any time, much less on a business trip. Did you know these negative effects on your body on drinking alcohol on a plane? Have you ever had a bad experience drinking on a plane on your business trip? Feel free to share your comments with us.